Sorghum ergot, caused predominantly by Claviceps africana Frederickson, Mantle, de Milliano, is a significant threat to the sorghum industry worldwide. The objectives of this study were firstly, to identify molecular markers linked to ergot resistance and to two pollen traits, pollen quantity (PQ) and pollen viability (PV), and secondly, to assess the relationship between the two pollen traits and ergot resistance in sorghum. A genetic linkage map of sorghum RIL population R931945-2-2 × IS 8525 (resistance source) was constructed using 303 markers including 36 SSR, 117 AFLP™, 148 DArT™ and two morphological trait loci. Composite interval mapping identified nine, five, and four QTL linked to molecular markers for percentage ergot infection (PCERGOT), PQ and PV, respectively, at a LOD >2.0. 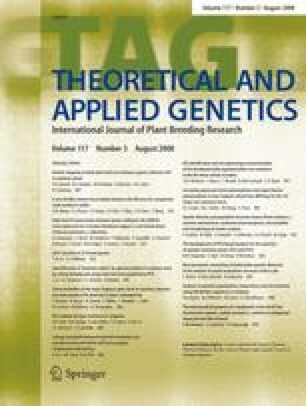 Co-location/linkage of QTL were identified on four chromosomes while other QTL for the three traits mapped independently, indicating that both pollen and non pollen-based mechanisms of ergot resistance were operating in this sorghum population. Of the nine QTL identified for PCERGOT, five were identified using the overall data set while four were specific to the group data sets defined by temperature and humidity. QTL identified on SBI-02 and SBI-06 were further validated in additional populations. This is the first report of QTL associated with ergot resistance in sorghum. The markers reported herein could be used for marker-assisted selection for this important disease of sorghum. This research was supported by the financial help of the Cooperative Research Centre for Tropical Plant Protection, University of Queensland, Australia; the Department of Primary Industries and Fisheries, Queensland, Australia and the Commonwealth Scientific and Industrial Research Organization, Australia.